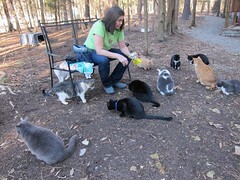 Chatham County’s privately run Goathouse Refuge, for instance, runs a small “cat house” with multiple places to hide and sleep; kittens live in a screened-in area. The cats also have the run of a fenced-in portion of the wooded property during the day. This was captured just moments after we opened the gate for the first time so that our cats could enjoy their new, 3-acre enclosure! Taken by Raleigh News & Observer staff writer Sara Peach during the summer of 2008. Additional video of cats on the refuge grounds available on our Flickr page.